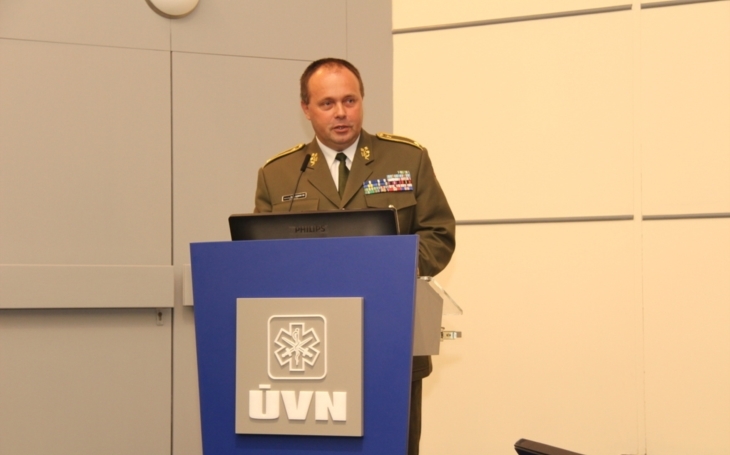 In an interview made during the Future Forces Forum 2018 Brigadier General Zoltan Bubeník, director of the Military Medical Agency and chairman of the Committee of Chiefs of Military Medical Services in NATO (COMEDS), described the highest level of coordination of the military medical service in the NATO armies, the role of the Committee of Chiefs of Military Medical Services and general principles respected during provision of medical care to wounded soldiers in foreign operations. At the microphone of Security Magazín I welcome Brigadier General Zoltan Bubeník. And I need to use my cheat sheet: director of the Military Medical Agency and chairman of the Committee of Chiefs of Military Medical Services in NATO (COMEDS). General, we are at Future Forces Forum, how do you like it, what attracted your attention. Good morning, first of all I would like to salute you. I thank you for the invitation to this interview. For me the Future Forces Forum is not the first event, I’ve been here in 2016 already, when we created, together with the organizers, a common forum, called CEBIRAM, which means medical and CBRN problematics, or problematics of protection against weapons of mass destruction. Of course I enjoy the interaction here, by the experts, expert conferences, linked by a direct projection with the practice, with the development of new technologies. It is an ideal opportunity to establish contacts with representatives of the military defence industry. It is your second day at the event, what attracted your attention? Because yesterday the program was very intensive, especially with the opening of the CEBIRAM congress where we had a panel discussion together with the experts of the medical service, from both the military and civil sectors, from our and international milieu, and on the CBRN problematics, I had little chance to swiftly visit the exposition in both halls. Nevertheless I was personally impressed that it did not concern just the military problematics, but a wider connection between the defence industry and security branches. I mean the army, police, prison service and fire and rescue corps, which shows the possibility to react on the complexity of acts which exist around us. Committee of Chiefs of Military Medical Services in NATO is a position which sounds very powerful, what does that committee deal with? The Committee of Chiefs of Military Medical Services is the highest advice body of the North Atlantic Alliance for the Military Committee in what concerns the military medical questions. In order you understand, all let’s call it Allied legislation which defines the use of medical elements in support of combat troops in operations, defines procedures, specifies standards in the area of medical treatment, but not just medical, but of course also veterinary treatment, and everything around the medical service, depends on elaboration, discussion and finally consensual approval by all members of the NATO. The committee is a bit larger than just member states, since it also includes the Partnership for Peace, it includes the Mediterranean Dialogue, and we also collaborate with Australia and New Zealand, so it really is a very wide military forum, and it’s main advantage is that the chairman of the committee is at the same time advisor to the chairman of the Military Committee of the Alliance. Let’s talk about a concrete case. From the media we know that there is a severely injured Czech soldier now in Afghanistan. I suppose that you handle such situations as an institution. What is happening, what should we understand when we hear a soldier was wounded and needs to get back to Czech Republic? We must be aware that, just like I was saying in the previous answers, we medically ensure every unit which is deployed in a foreign operation, be it Afghanistan, Iraq, Africa, just anywhere. And in the places where we cannot rely on support by the host region, by an adequately developed medical system, we definetly have to dispose of our own medical back-up. From providing of usual first aid, premedical, medical first aid, to the so called hospital, we need to ensure everything by own forces. I guarantee that the soldiers who get wounded, be it in combat action or non-combat situations, in any foreign operation, get maximum treatment. Our medics are exercised for it. We also exercise common soldiers in providing first aid in order to ensure the efficiency right on the spot. At the same time, thanks to the transport possibilities in Afghanistan, be it by land vehicles, or by helicopters or aircraft, the wounded soldiers gets adequate extended treatement and medical aid as soon as possible. Of course sometimes after those surgeries or in relation with the seriousness of his health condition, there can’t be all the specialists ready in the area, so it is necessary, if the health condition allows for it, after stabilization, to transport the patient back to his home country, in our case to the Czech Republic, using our STRATEVAC, which is an aircraft fully adapted for this, equiped so it can transport a stabilized patient for a definitive treatment in the Central Military Hospital or in military hospitals in Moravia. General, maybe not very typical, but let me wish you good health and good luck. Thank you very much, and than you for the possibility to talk.